Here at the Lion we provide superior accommodation for golfers looking to experience the surrounding golf courses within the Gwynedd and North Wales area. We can offer excellent deals as well as discounted Dinner, Bed & Breakfast and Bed & Breakfast Rates. We are ideally located within 10-30 minutes of seven courses. All our rooms at the Hotel are en-suite; we have a well-stocked bar; a beautiful restaurant and a pleasant beer garden. 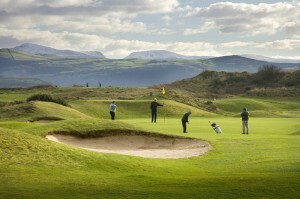 We know too well how stressful it can be organising a large group for a break away; let us take care of everything for you.Why is Criccieth the best base to Golf in North Wales? 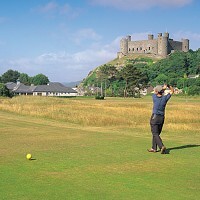 Not only is Criccieth a charming, beautiful, seaside town but it is geographically the best location to explore the surrounding seven golf courses. Being slap bang in the middle of all of them. This central location gives Criccieth a distinct advantage over other towns. So what are the benefits of booking with the Lion? We have 30+ years of experience in arranging tailor made packages to suit your group, we have arranged countless golfing breaks and can set up discounted green fees. We are centrally located in Criccieth, various restaurants, pubs and shops are minutes’ walk away. 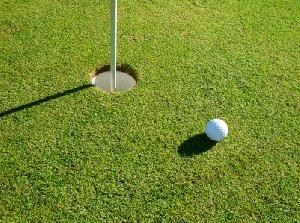 We are in a position to pre arrange discounted green fees with the golf clubs. Our recently refurbished bar is the perfect venue to enjoy a few beers after a great day of golfing; we also serve up delicious bar meals that offer fantastic value. We can easily accommodate large groups. *Packages based on low season rates March-Sept 2017 inclusive for minimum groups of 8. For off peak packages please contact us with your requirements. As well as offering tailor made packages, if you would prefer to organize your own golfing we also offer simple Bed & Breakfast, and Dinner, Bed & Breakfast rates.